Why not choose a campsite in Gironde for your next holiday! Nestled amongst the vines, the camping Yelloh! 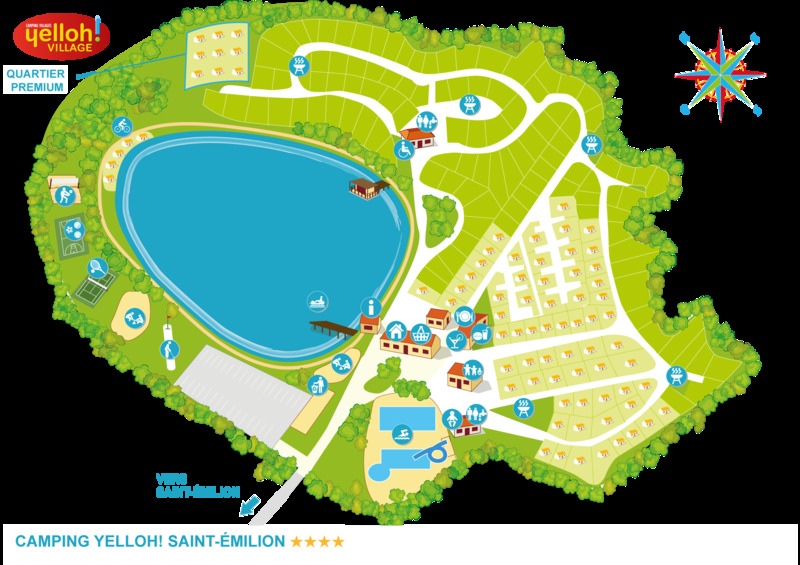 Village Saint-Emilion provides comfort and relaxation for the whole family! With 10 hectares of greenery, come and enjoy a getaway where you can really recharge those batteries! Visits to vineyards, wine tasting and an introduction to oenology, exploring Bordeaux, sports and games, swimming and fun in the partially covered heated pool area, a spot of fishing in the lake... there is simply so much to do with family or with friends at the Yelloh! Village Saint-Emilion. You'll love this unusual region with its unique landscape, and you'll be really thrilled if you come and stay in our campsite in Saint-Emilion, in the Gironde! Very good. helpful staff and a warm welcome. Enjoyable relaxing holiday.very helpful staff.very clean and well organised environment.restaurant of a very high standard. If you know about Aquitaine because of its coastline, you'll be amazed to discover the various gems concealed within the region! During your stay at the camping Yelloh! Village Saint-Emilion, why not spend a while exploring this lovely region? Stop off in Bordeaux, the world's top wine city, which is also known as the Pearl of Aquitaine. Over the years, Bordeaux has managed to preserve its exceptional historical and architectural heritage. Take the opportunity to visit the Bordeaux's iconic Cité du Vin, an extraordinary swirl of a building dedicated to wine and its culture, in every sense of the word. Take a stroll through its streets and have a look at the famous Port de la Lune, which has been listed as a UNESCO World Heritage Site since 2007. Continue your trip with a stop off in the mediaeval town of Saint-Emilion, with its steep alleyways. Built within a limestone valley, this town is thoroughly charming. Well-known for its wine, why not spend an afternoon visiting its châteaux and enjoying some wine tastings? With Château Bernateau, Château Tour Vachon, Château Champion and many others to choose from, which great wine will take your fancy? A region known for its gastronomy and a paradise for any foodie! High quality local produce and traditional dishes, truffles, oysters, foie gras, cassoulet... without forgetting the inimitable Bordeaux “cannelés” and the famous Saint Emilion macaroons. Discover the unique flavour of south-west France! With your family or with your friends, you'll love staying in this region when you spend your next holiday in our campsite in Saint-Emilion!